"Should have been here yesterday," was the quote of the day on Friday at Steamer's Lane in Santa Cruz, California as paddlers gathered for the 25th Santa Cruz Kayak Surf Contest. Fortunately, we were there and enjoyed a beautiful sunny surf session on Thursday. After our surf session on Thursday, we went to the contest check in and pre-event party at Adventure Sports. Spirits were high as event participants enjoyed live music, bbq, and socializing. It was fun to see familiar faces and to meet other surf paddling enthusiasts. Friday morning, we awoke to stormy conditions. The wind was blowing 20-30kts with stronger gusts, swell size was considerable, and it was raining sideways. Spectators were treated to the rain blowing right at them, and the competitors were treated to the wind blowing them off the waves and even sometimes toward the cliffs. Jeff was competing in the high performance men's division in a field of 27 kayak surfers from around the world. Surfing Steamer's Lane is usually a treat but this weekend it was gnarly and bordered on dangerous for all but the most skilled paddlers. On Saturday, many of the competitors couldn't successfully launch off the beach where an unofficial contest for best beat-down occurred. The participants who did make it off the beach had an arduous paddle out against the wind to get to their heat. Between conditions at the beach and the wind, many did not make it to their heats. Those who did make their heats were trying to catch the outer edges of the break and avoid carnage. I took a look at the conditions and didn't even suit up for battle - my story is on my woman on water blog titled "Skunked." Despite the poor conditions there was some spectacular kayak surfing. The hull speed of the international class boats gave some of the best rides of the weekend. Photographing and videoing the event was a challenge with wind and rain driving right into the lenses. 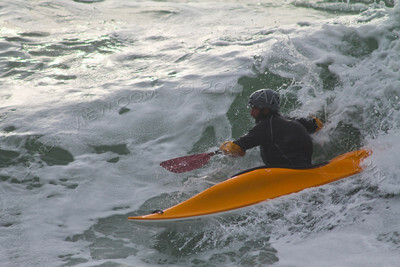 Of course Dominick LeMarie managed to get great shots as well as our fellow Bay Area Sea Kayaker Anders Landin. (Jeff is in Friday's photo sequences of Dominck's # 113-133 and Anders from #179-197). 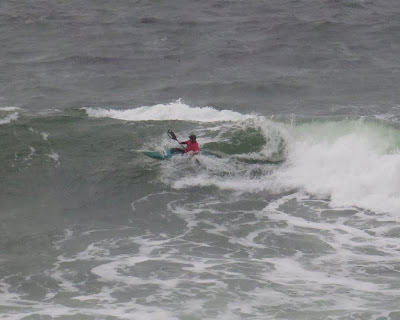 Jeff commented that he was mostly in survival mode out there; however, he did manage to surf some waves and score points. He placed 14th which is quite respectable in the world class field of the men's high performance category. Here's a YouTube Video of our footage from the event.